A couple weeks ago we have been in Sintra, a lovely town in southern Portugal that is becoming quite popular for mountain biking. 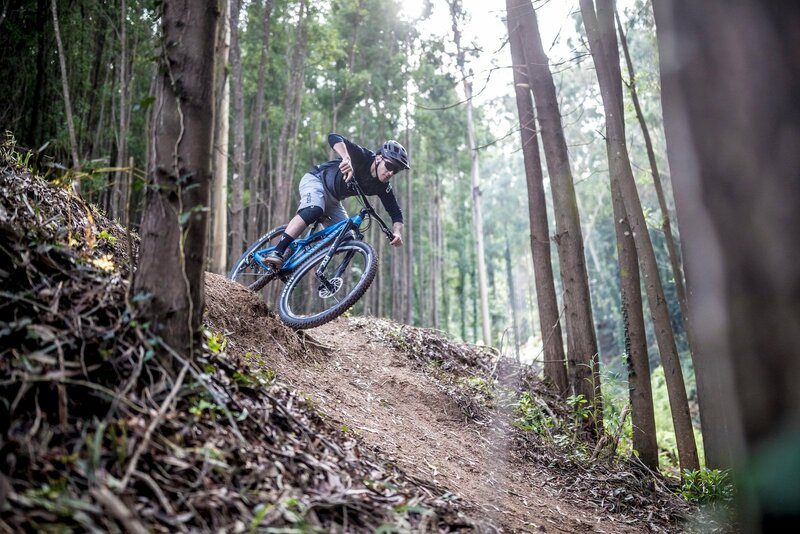 It’s not far from Lisbon, on the slopes of a natural park that separates it from the Atlantic Ocean with modest mountains that don’t exceed 529 meters of altitude but still that offer a multitude of trails open to MTB. They’re well cared for, sufficiently technical and very fun to ride. 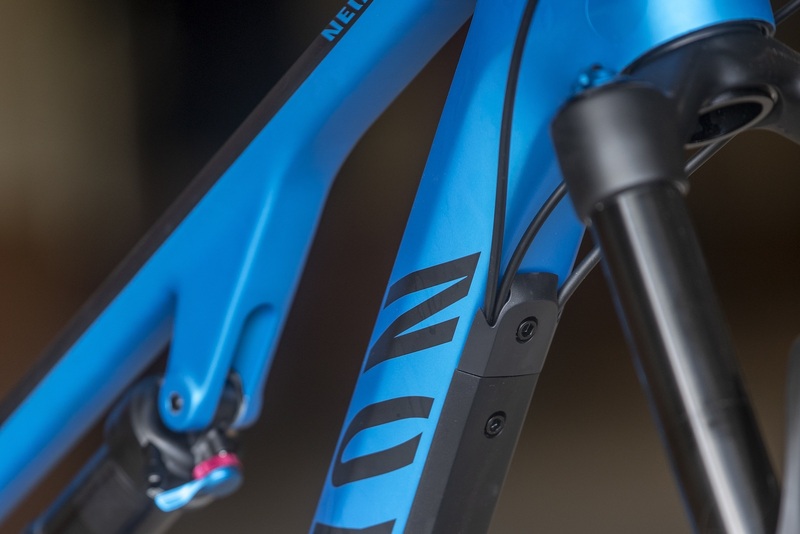 The purpose of the trip was the presentation of the Neuron CF, the new iteration of Canyon’s bread and butter trail bike. 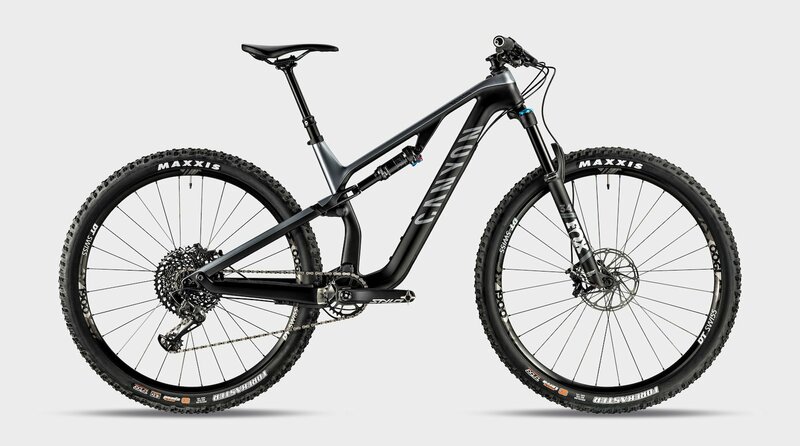 In fact, what makes this particularly exciting is that it is the brand’s first 29″ carbon bike. With the new Neuron CF, a very versatile trail bike, Canyon now covers the entire range from Lux for XC to the new Spectral, recently equipped with longer travel. The design represents a meeting point between Lux and Spectral and reflects the aesthetics of the new Canyon lineup, introduced in 2016 with the Sender and progressively applied to the whole range. The particularity of the previous model of Neuron having different wheel size based on the size also carries over on this new model. 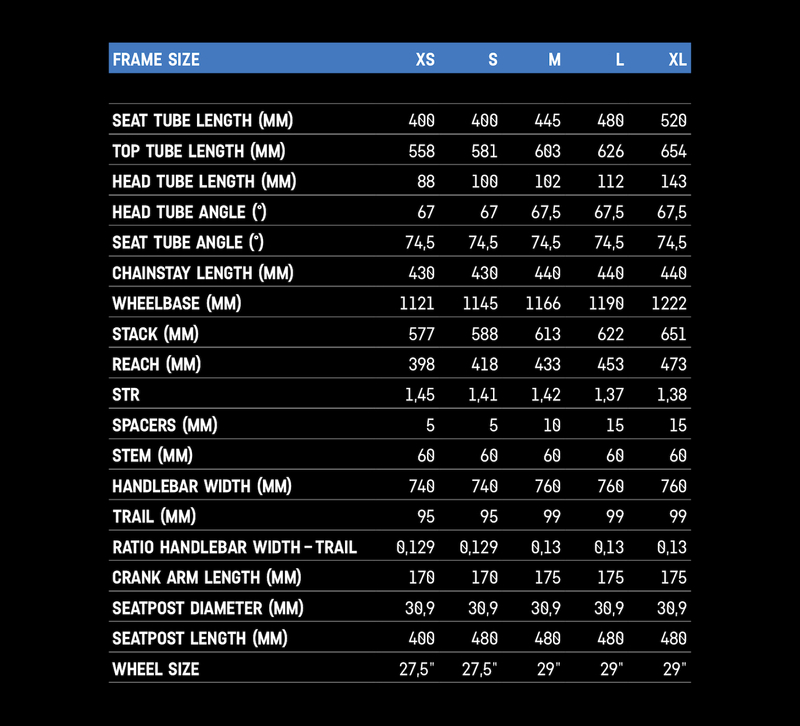 For the latter the travel (130mm at both wheels), is the same for both sizes that adopt the 27.5″ format (XS and S) and for those adopting the 29″ format (M, L and XL). 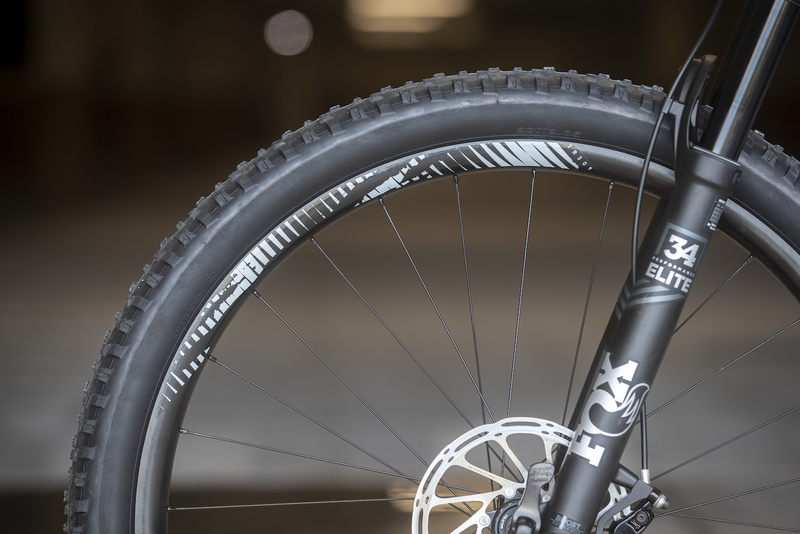 The fork, a FOX Float 34 for all specs, is spec’d for 29-inch wheels and with a 51mm offset for all sizes, even those that use 27.5″ wheels. This way, Canyon’s designers have maintained similar geometries while using different wheel formats, offering a similar behavior on the trail for all sizes. 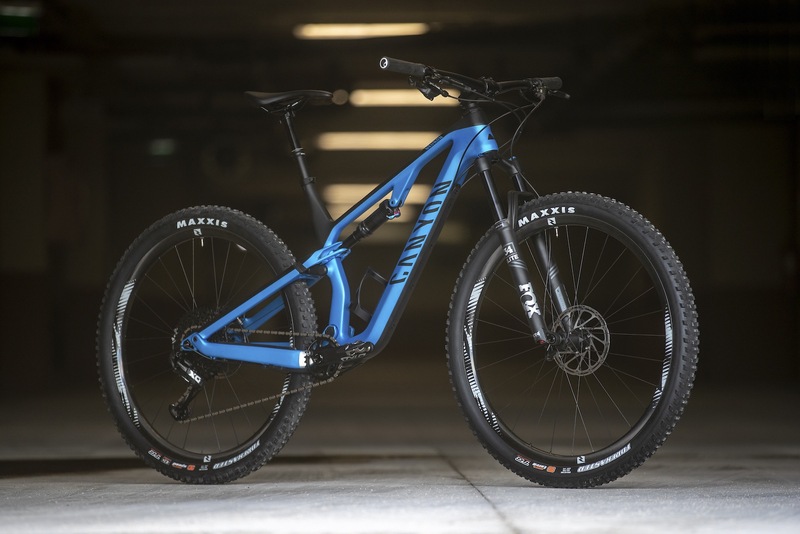 The different amount of trail, obtained by modifying the head angle by half a degree, was chosen to combine with the different width of the handlebars, 740mm for the 27.5″ compared to the 760mm used on 29″ wheels. This offers a similar lever ratio between handlebars and wheel contact point for both wheel sizes. The frame is entirely made of unidirectional carbon fiber, both front and rear ends, while the yoke that drives the rear shock is a special plastic composite reinforced internally with carbon fibers and equipped with metal inserts for the bearings and the shock mount. The suspension system takes up the pattern used on the rest of the fully suspended range with a Horst link four bar, positioned above the rear axle and with a somewhat horizontally positioned rear shock. Also the concept of the compression curve which is divided into three phases, is already represented in the Sender, the Torque and the Spectral. It’s now a feature of Canyon on the whole. The first phase is the initial stroke up to the sag zone and offers a lot of sensitivity, the second phase, the central part of the travel, is stable to allow the rider to mash the pedals without the suspension sinking too much, and the third and final phase, it is progressive enough to avoid using the entire travel when not essentially needed. The anti-squat is very well calibrated so that the suspension remains actually stable while pedaling, provided you have inflated the shock to the 28% sag recommended by Canyon. The rear shocks are FOX Float DPS on all specs. A 210x50mm shock absorber is used on sizes ranging from M to XL while for sizes S and XS the shock has a 190mm eye to eye with a 45mm stroke combined with a different sized yoke to offer the same travel with a higher leverage ratio (2.89 vs. 2.6) and therefore suitable for lighter riders, with greater initial sensitivity and equal resistance to bottoming, without the need to intervene with the hydraulics. The shock’s positioning leaves adequate space for a full size bottle cage, better if sideloader. Canyon has applied three threaded holes to accommodate its Eject double bottle holder. All the bearings that the suspension system rotates on are lubricated with high performance grease, and sealed, so as to prolong their life and therefore their performance. 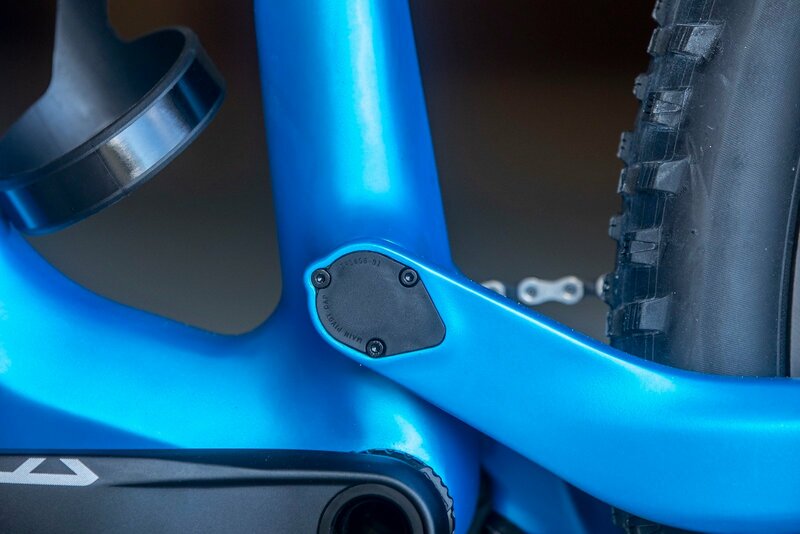 The joint between the yoke and the chainstays covered by the linkage itself which, in addition to protecting it, hides it, making the design extremely clean. The main pivot linkage bearings, two on the right side and one on the left side, are carefully sealed thanks to an additional x-ring and a cover fixed to the frame by means of three allen screws on each side. 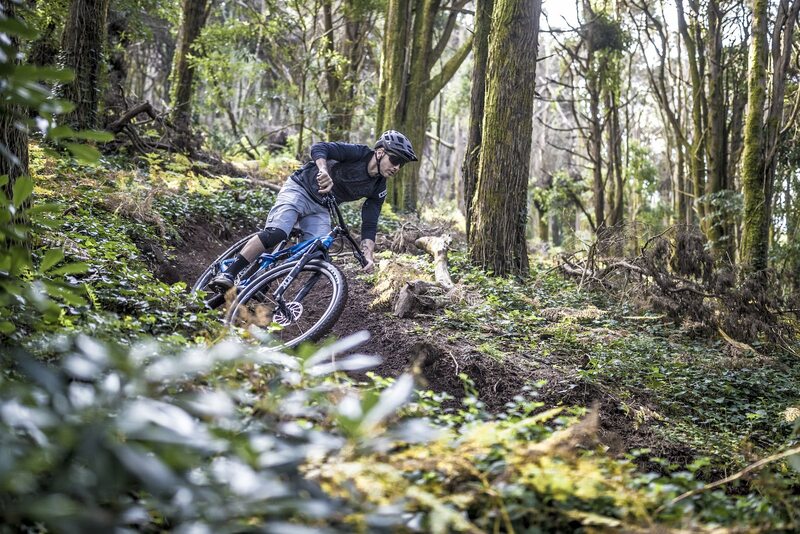 The Canyon solution for cable routing is the proven Cable Channel used on all the latest full suspension bikes in their range. The Cable Channel is a shell screwed to the frame that houses and protects the cables as well as the frame itself. This solution allows you to easily remove the cables from the frame while maintaining a clean design similar to that of a standard internally routed frame. Each section of the channel can be replaced individually in case of damage due to impacts. Also present is the traditional IPU (Impact Protection Unit), a steering lock system patented by Canyon to block the rotation of the handlebars before the brake levers hit the top tube in the event of a fall. The screws that fix the IPU system to the frame are hollow and designed to break in the event of major impacts so that the impact does not damage the frame itself. 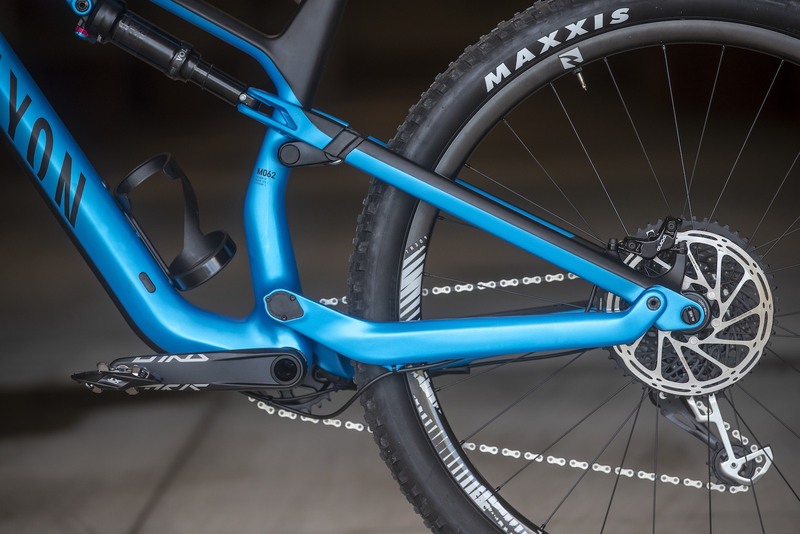 The rear axle is the extremely practical Quixle developed by Canyon, a thru axle with hidden lever that during riding remains hidden inside the axle, but if necessary it can pop out to loosen it. The different spec levels offer different options for the components. 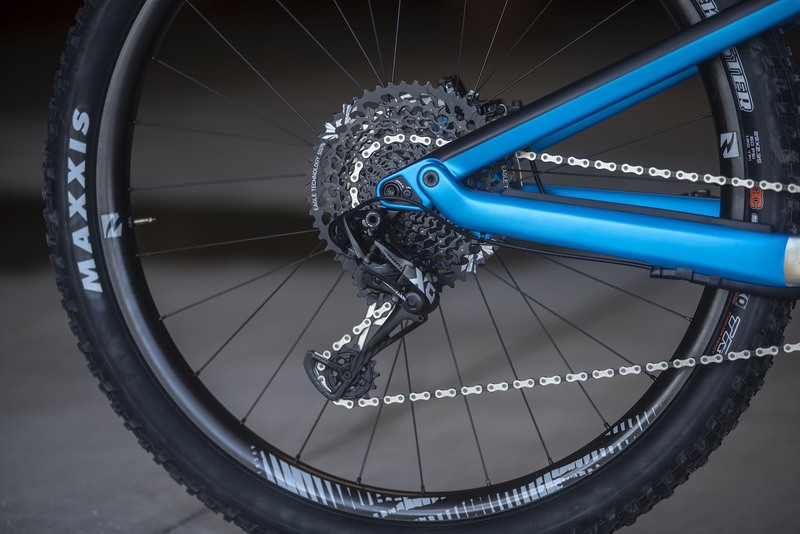 The drivetrains are 12-speed SRAM Eagle on all versions. 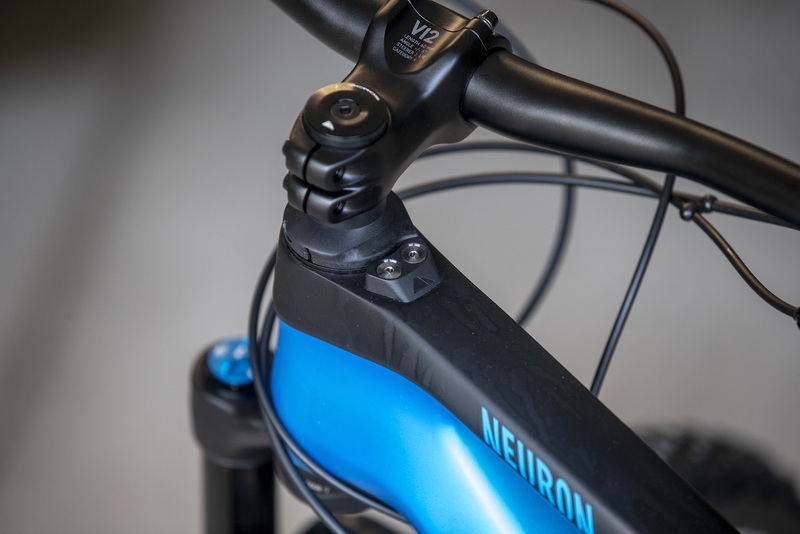 The Neuron CF offers the option of mounting a front derailleur, or alternatively a chain guide, thanks to a lower direct mount support integrated into the frame. 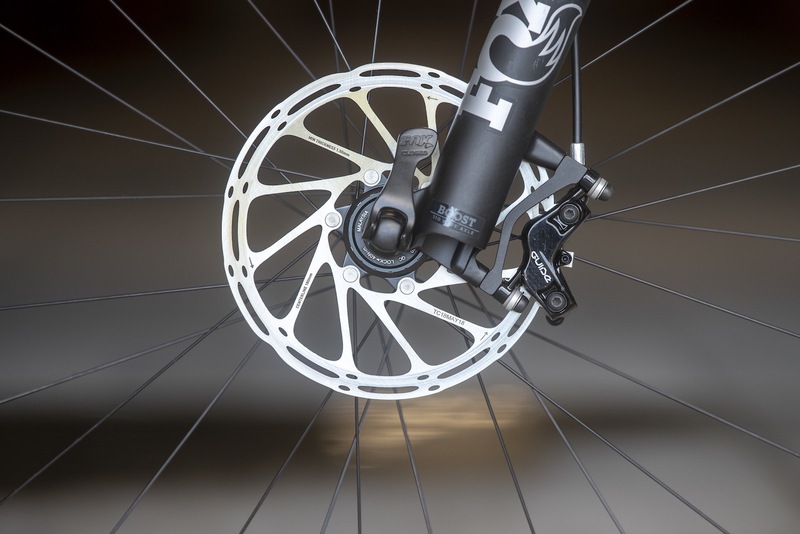 The wheels are all DT Swiss, in different models depending on the pricepoint, except for the 9.0 SL test rig which Canyon adopted the Reynolds TR309 wheels, an “inexpensive” product within the Reynolds lineup but definitely worthy on trail. The tires are the Maxxis Forekaster 2.35″ with 120tpi EXO casings and the 3C compound. 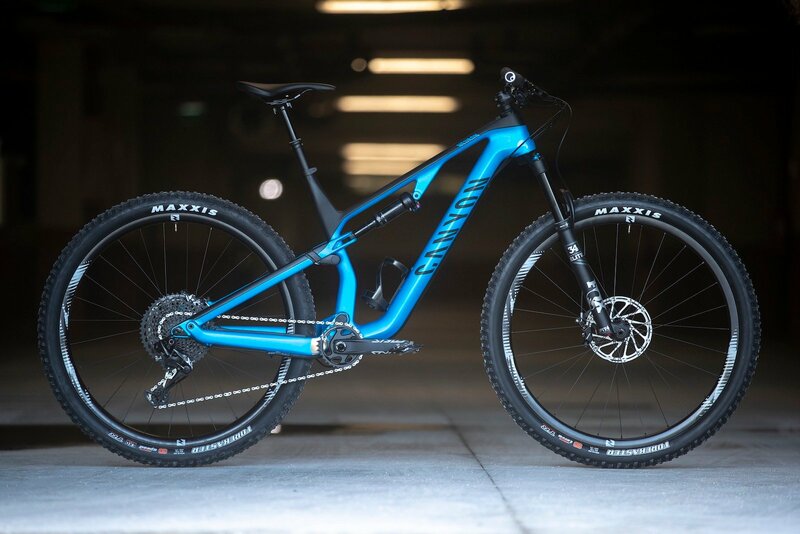 Canyon provides the tires fitted with tubes but being that the wheels and tires are Tubeless ready, the transformation is simple to implement. This is a tire that I’ve never had the opportunity to try and that I found particularly reliable and confident on the downhills, obviously related to the intended use. 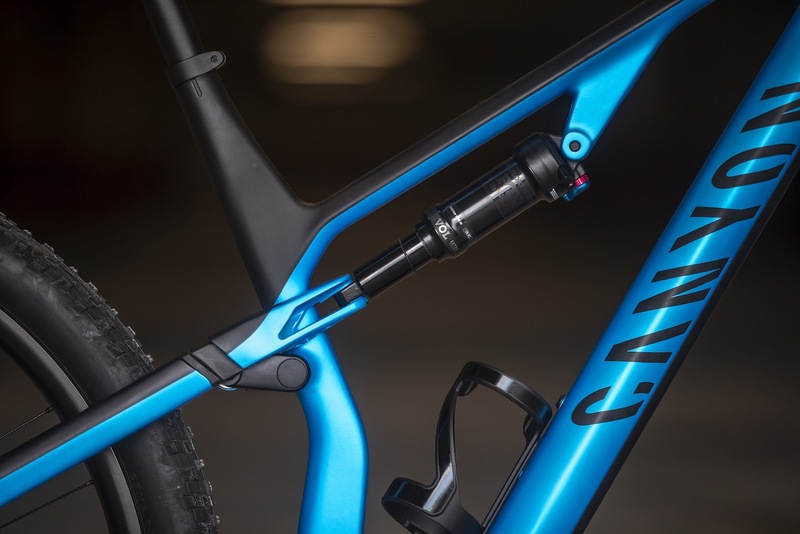 The top end spec levels (9.0 Unlimited and 9.0 SL) have FOX Transfer dropper seatposts while the other outfits use the Iridium dropper, Canyon’s in house seatpost. All sizes have 150mm of travel, with the exception of the XS which features a 125mm of travel. 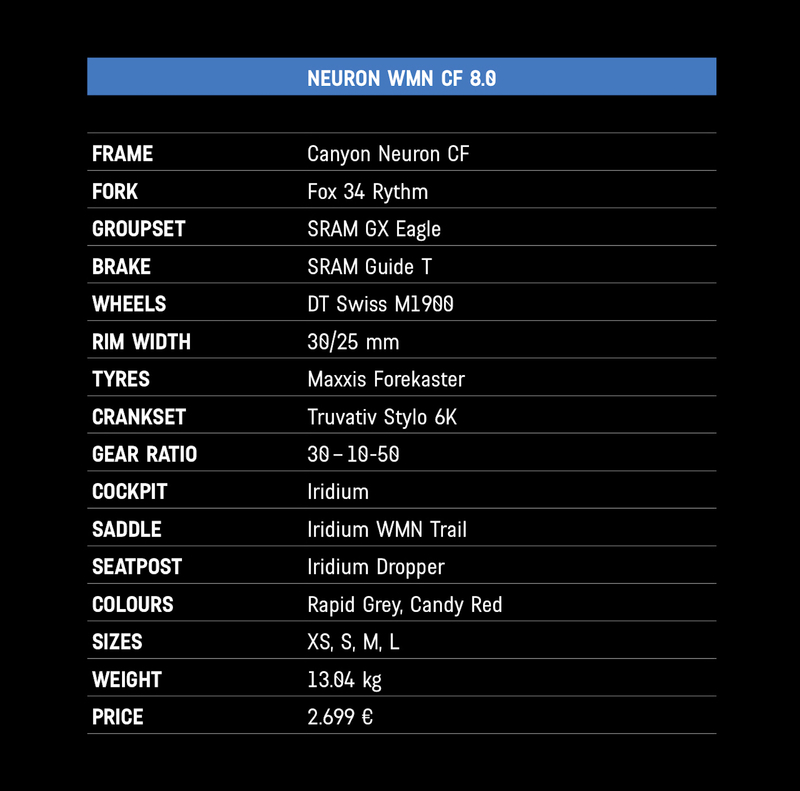 The brakes of the Neuron CF are the SRAM Guide, in the R version for the 9.0 SL fitting under test, with Centerline Center Lock 180mm rotors both at the front and at the rear, where the frame offers a direct mount fitting. 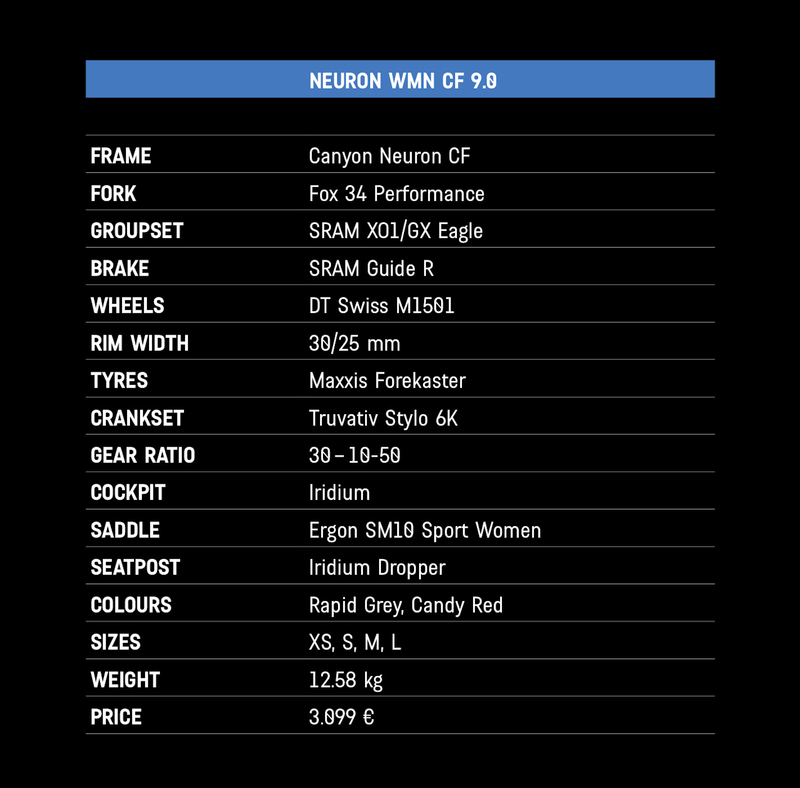 Contrary to current trends that see aggressive geometry even on the trail bikes, Canyon has chosen careful, well-balanced numbers, which classify the new Neuron CF as an intuitive, sprightly bike. 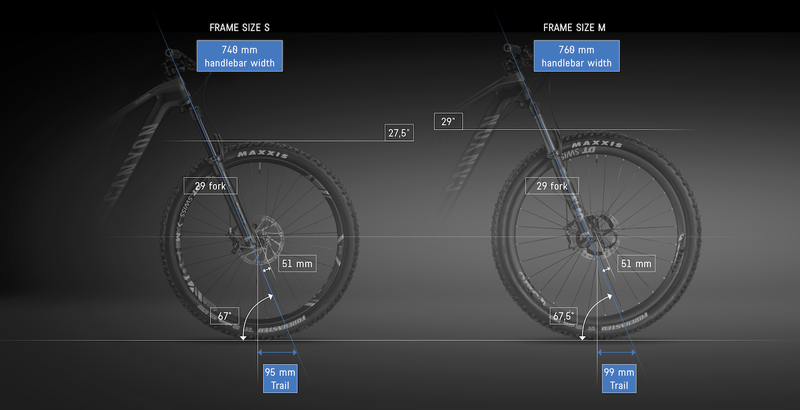 Due to the wheel diameter, the difference in size varies between the small and large sizes in the chainstay length, the BB height and the standover, as a way of compacting the small sizes, while other dimensions such as the head tube angle and the trail are deliberately different to make handling with both wheel sizes as similar as possible. 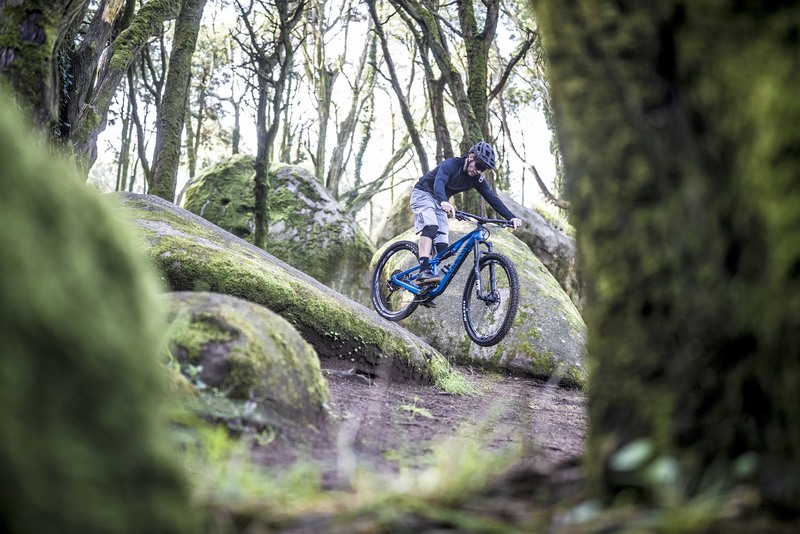 After setting up every detail of the Neuron CF we headed to the trails of Sintra to test the new Canyon. 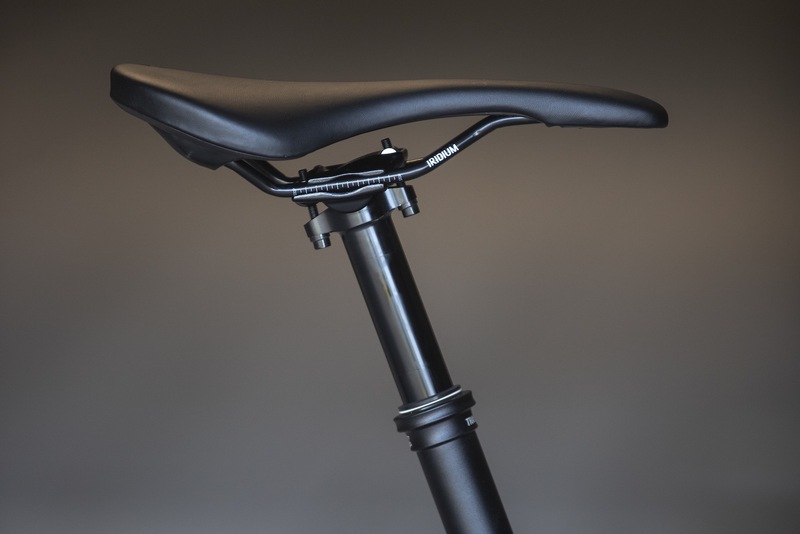 The position in the saddle was immediately comfortable and balanced, rather roomy and relaxed, partially due to the 60mm stem. We faced an initial long climb which took us to the highest point of the mountainous area of ​​the park from which several trails depart. 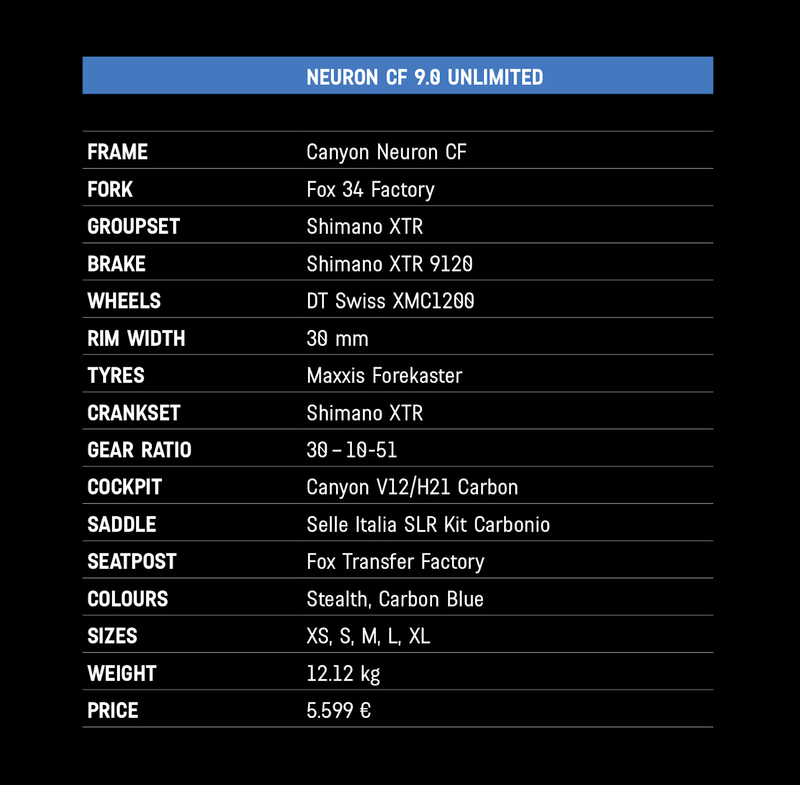 The Neuron CF proved to be comfortable and intuitive, with good stability in the suspension system even when the shock was left in the open position. 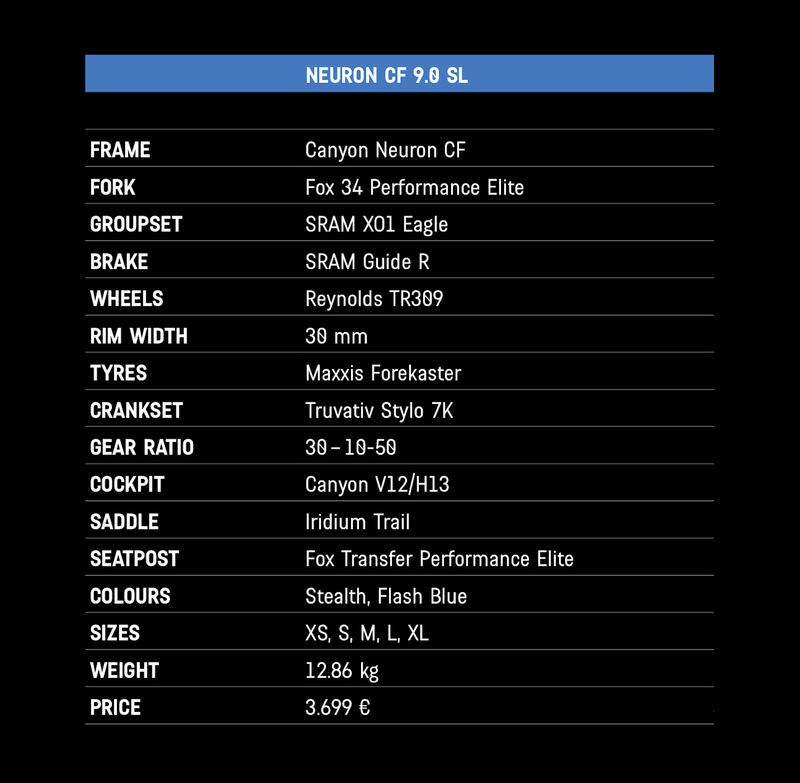 Climbing capability was fairly average while it was in the technical climbs that the Neuron CF shines with agility and maneuverability, well balanced between the precise steering and the traction of the rear wheel. 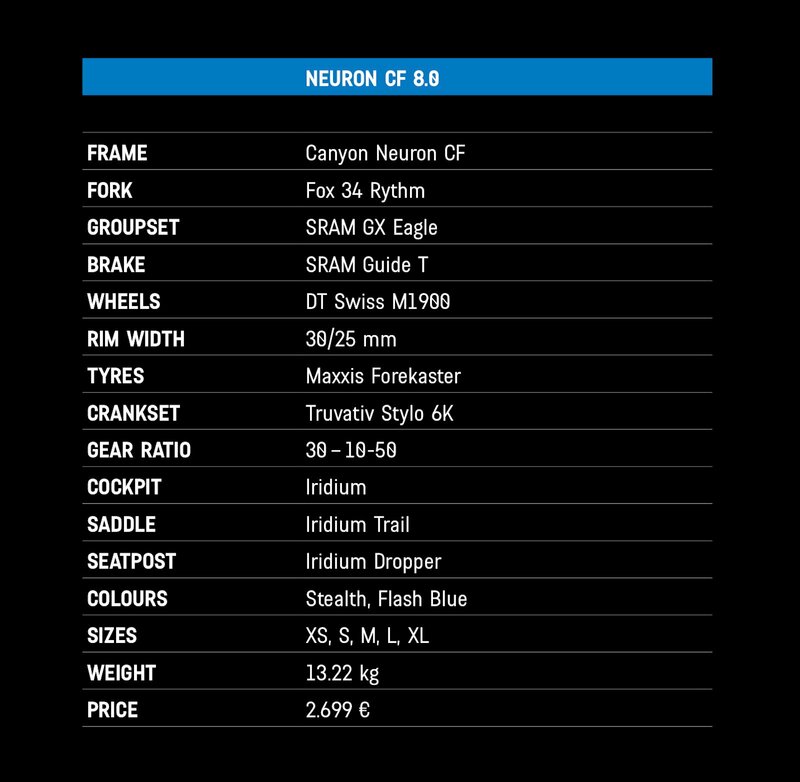 Even on the downhills, the balanced geometry of the Neuron CF make it intuitive and easy to ride, with precise handling and good stability. After the first more challenging descent I added 10psi more in the fork than the pressure recommended by Canyon for my weight (you will find the chart in the user manual provided with the box). This gave me better support up front and, in general, a better balance between the front and rear suspension. 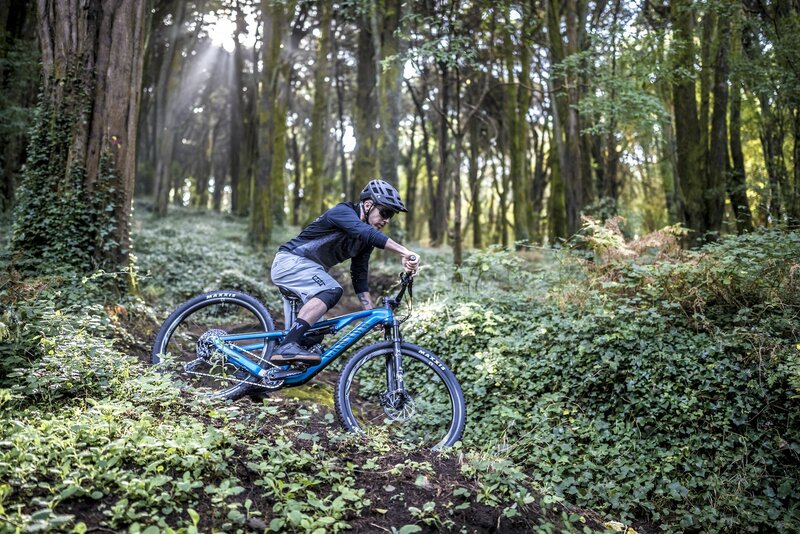 This is not a bike with a particularly aggressive nature, but rather a trail bike suitable for everyone, versatile and easy to get along with, but still very high performance. In fact, you can have fun looking for the limit in the technical and rough bits, even at high speed, getting excellent feedback and always remaining within a safe margin that allows you to easily recover from any errors. 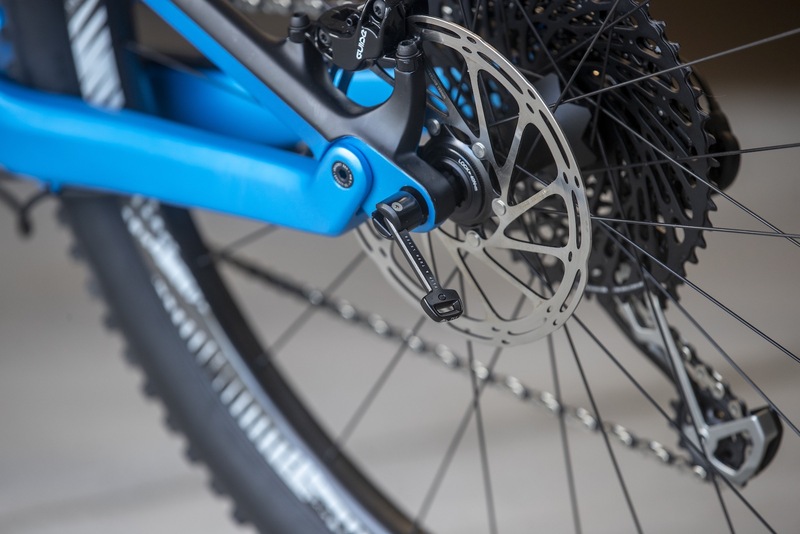 The suspension system, responsive and lively, is always ready to manage hits, even in rapid succession, without going into crisis by stiffening or causing the bike to lose stability. Canyon has created a trail bike suitable for all types of riders, from the newbie who is looking for an easy and fun bike, to the more experienced rider who expects high performance for long, alpine rides or for fast rides on the home trails. Sturdy, solid and silent, it offers equipment adapted to the intended use and various intelligent solutions that now represent a trademark for Canyon as a brand.